Epiphanie ou la visite des rois mages. In France, Epiphanie is celebrated 2 weeks after Christmas. It symbolizes the arrival of the three wise men in Bethlehem to greet Jesus. Families gather to share the galette des rois or Kings' cake. The French king's cake is different from what is served in Louisiana around Mardi Gras. 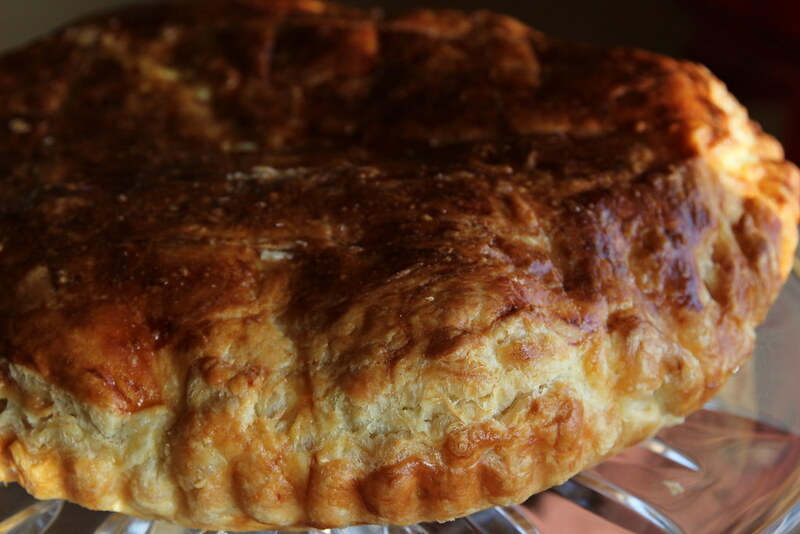 The galette des rois consists of two layers off puff pastry filled with frangipane, which is a custard-like filling made from ground almonds. Inside the gallette, the baker will place a "feve" and whoever finds the feve in their slice of gallette will become king or queen for a day. The gallette are typically sold with a foil king's crown that will land on the lucky eater's head. And unlike the New Orleans version, the person who finds the feve has no obligation to buy next year's cake. Originally, the feve, which translates to bean, was just that: an uncooked dry bean. Over the years, the feve has evolved to become a porcelain token that is painted and glazed. Many people collect feves and there are now many designs. The desgins can tie into a popular cartoon character (think a whole set of Lightning McQueen, Mater and friends) or a cultural event like when France celebrated the 200th anniversary of the French Revolution, feves were drawn up to represent major revolutionary figures or event. With the family gathered around the table, the youngest person hides under the table and randomly assigns the pieces of galette to everybody present. This insures everybody a fair chance at getting the feve. Once somebody finds the feve, he or she is declared king for the day and receives the crown. Choosing a queen or king to share their day is optional but pretty popular, and most galettes are sold with 2 crowns for that reason. The tradition of the galette des rois is so popular that individual mini-galettes are served in cafeteria's around the country, from elementary schools up to the french presidential office's cafeteria. In this case, feves are randomly dropped in the individual galettes. 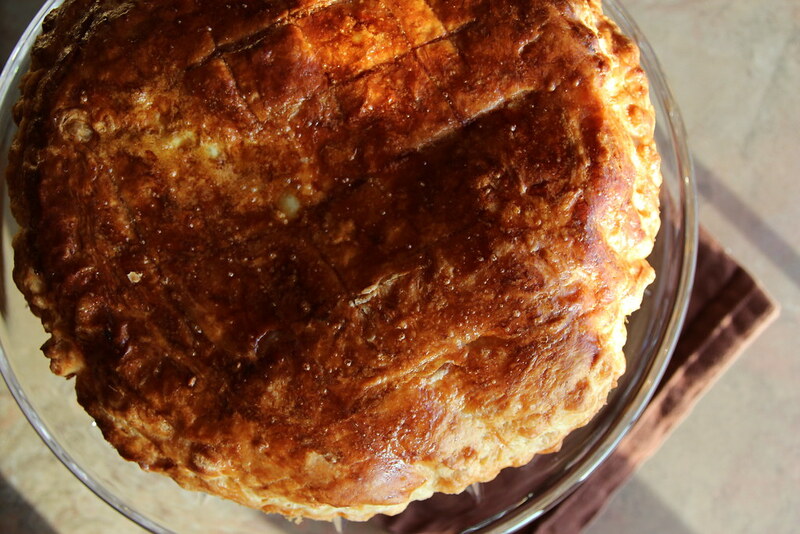 The galette des rois or Kings' cake is eaten in France to celebrate the Epiphany's holiday. It is very simple to make even if the term "frangipane" (which is a creamy almond filling) sounds complicated. Thaw the puff pastry sheets until they are easy to unfold and handle. It takes about 30 minutes. Meanwhile, you can start making the frangipane. I bought whole almonds and placed them in a food processor to grind them into almond powder. It takes less than a minute. After transferring the almond powder to a mixing bowl, I added the sugar, 1 egg, the melted butter and the almond extract. Folded everything together and that's it! The frangipane is ready to move to the galette. To make the galette, place one sheet puff pastry on the bottom of a tart pan, a cheesecake pan or directly on a cookie sheet. Then spread the frangipane on the puff pastry, starting from the center and stopping about half an inch from the edge. Place your feve or token in the frangipane, preferably toward the edge so you have less of a chance to hit it when you cut the cake. Lay the second sheet of puff pastry on top and seal the edges together to close the galette up. With the tip of a sharp knife, scar the top of the galette in a diamond like pattern. make an egg-wash with the egg yolk and a little bit of water beaten together then brush it on the galette. This will give the galette a nice golden color as it cooks. Place the galette in a 400 degrees oven for about 30 minutes. When it is ready, get it out of the oven and let it cool a little bit. Place a foil crown on it and you are ready to serve. The tradition wants the youngest person in attendance to crawl under the table to assign each piece of galette randomly to the guests. The person who finds the feve is king for the day and gets to wear the crown.